Designated the LLCD series, a typical machine consists of a heavy duty, structural steel base housing a drive system linked to a lapping plate. A polishing pad (type dependent on material to be processed) is bonded directly to the plate. A swing arm assembly positioned above the polishing surface is mounted to a swivel head workpiece pressure plate. Workpieces of varying geometries can be retained by surface tension, wax or vacuum to the pressure plate. The pressure plate is designed to swivel up from the horizontal position to facilitate load and unload operations. 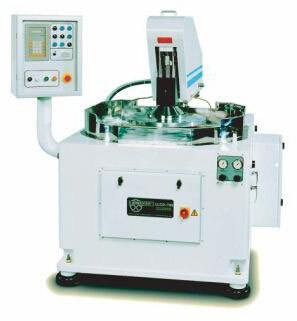 The equipment is particularly useful for polishing single, and large area glass substrates. Lapmaster offers five basic machines with polishing plates varying in size from 600 mm to 1000 mm diameter. Single workpieces ranging from 480 mm to 780 mm diameter can be accommodated.